“Josie,” a friend of Ferguson Officer Darren Wilson, called into The Dana Loesch Radio Show today. Josie gave Officer Wilson’s side of the story. 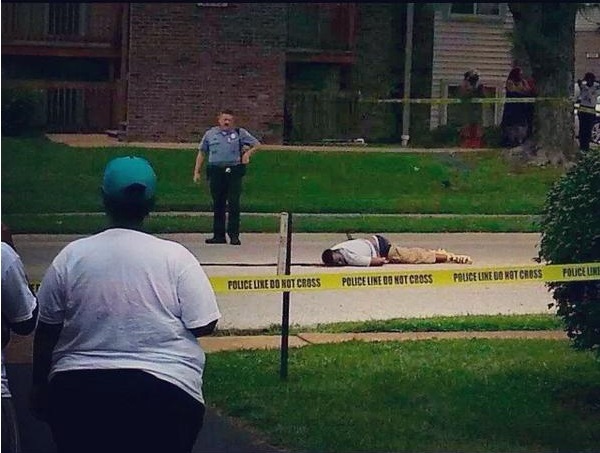 Michael Brown lies on the street in Ferguson after he was shot dead last weekend. “He pulled up ahead of them. And then he got a call-in that there was a strong-arm robbery. And, they gave a description. And, he’s looking at them and they got something in their hands and it looks like it could be what, you know those cigars or whatever. So he goes in reverse back to them. Tries to get out of his car. They slam his door shut violently. I think he said Michael did. And, then he opened the car again. He tried to get out. He stands up. And then Michael just bum-rushes him and shoves him back into his car. Punches him in the face and them Darren grabs for his gun. Michael grabbed for the gun. At one point he got the gun entirely turned against his hip. And he shoves it away. And the gun goes off. You can watch the video at Dana Radio. Dana says the caller was vetted. More… Earlier this week the police said the toxicology report will take four weeks to complete.